Restaurant Alla Piazza di Sopra in Filetto. A medieval street in the Lunigiana village of Filetto. Filletto is a tiny medieval-looking village built originally as an ancient stronghold. Located just off the main road from Villafranca in upper Lunigiana, it is well known for its Mercato Medioevale every August, as well as its Mercatino antique market on the last Sunday of each month. Charmingly, it is still surrounded by field and paddock, but this gem of a village is contained entirely within its quadrilateral defensive walls, most of which also serve as the walls of residences. Since you can no longer drive through town, park outside the gate as you approach from Villafranca and walk through this different world. There are all the wonderful accoutrements of an unspoiled medieval village –crowned and cobbled narrow streets, romantic-looking porched entrances, mysterious wall niches, and suspicious cats. Along the entry street, a large piazza opens with the village church on one side- a low old church - and opposite, a stone ramp leads up to a gateway. Beyond that gateway is the Piazza di Sopra, also known as Piazza Immacolata, which was the original fort with four defensive towers. Directly across the piazza from the entrance gateway is Alla Piazza di Sopra, tucked into a corner. The menu varies by season and availability of ingredients. Alla Piazza di Sopra Ristorante opened last July (2011). The pride of the restaurant is the use of fresh, seasonal, local ingredients to create dishes typical of the area. Not only are the pastas made in-house, but the salumi are local as well. The offerings are presented in a well-decorated, quiet dining room or, in warm months, at tables on the Piazza. A diner can immediately feel the sincerity of the proprietors, the Falorni family, and their desire to please their guests. The mother, Tiziana, cooks with help from daughter and sommelier Laura, and daughter Chiara is a patient and attentive server. A grandson runs in every once in a while for Italian authenticity. On a recent rainy Sunday, three of us stopped in for lunch, and we really wished we had bigger appetites. The food was fabulous. 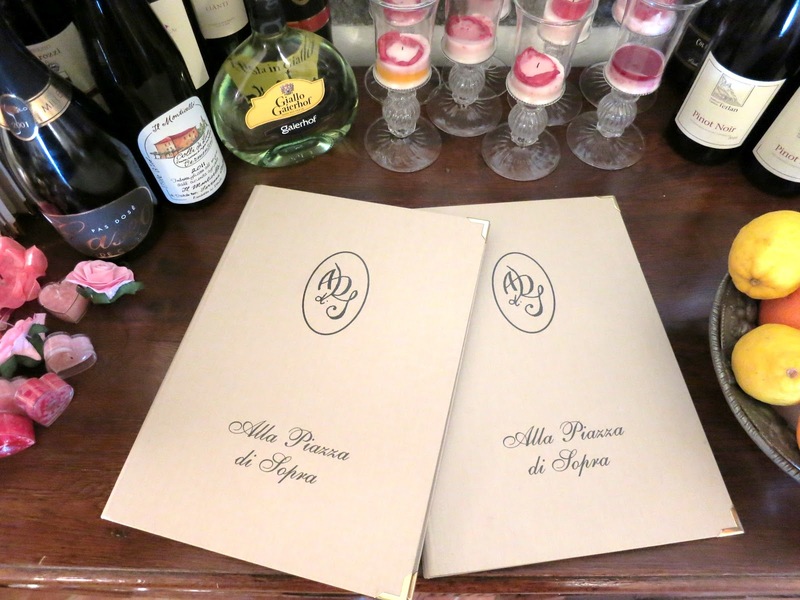 The menu was presented verbally, and after serious bargaining between ourselves, we ordered. (Look below for a link to a sample menu in Italian and English.) Shortly after we ordered, we were served a pleasant and complimentary starter. A decorative presentation of a circle of fried Parmigiano, a little wedge of honey croissant, and a dollop of absolutely fresh ricotta. Our antipasti, photographed some bites late. We ordered two antipasti to share. The first was, of course, the salumi – seven different kinds, including a house-made bresaola, several variations on cured sausage, a delicate pancetta, a local prosciutto, and (we think) a culatello, garnished with one perfect strawberry. The second was a dish of vegetable torte: cylinders of potato and Parmigiano, baked until just brown; delicate little towers of grated carrot, lightened by we know not what; pieces of a torte of tender pastry filled with a sweetly cooked filling of onions from Bagnone. Somehow the serving included three portions of each dish – a thoughtful accommodation of our request to share. Main dining room, Alla Piazza di Sopra. For the primi, we had each ordered one of the special dishes, but of course we passed them around without shame every few minutes. The first was Ravioli con Radicchio - ravioli stuffed with radicchio, garnished with pignoli and served in a sauce made with reduced Vermentino rosso. It sounds complicated, but each of the tastes was clear and true. The second was Testaroli al Pesto (who can resist?). As tender as can be, with the perfume of the pesto preceeding it. It was a worthy representation of this local specialty. The third primi was Ravioli con Speck e Caprino, this ravioli was filled with a great combination of smoked seasoned ham and creamy goat cheese, garnished with sauteed tiny cubes of pear and served with a sauce of gorgonzola. Now that may sound pretty heavy, but this presentation was exquisite - everyone’s favorite. Tiziana the cook came out to inquire as to our reaction, and beamed – perhaps not for the first time – when we called it a miracle. Typical ending at Alla Piazza di Sopra. If we’d had enough appetite, we would have definitely ordered secondi. Especially true, since they offered the succulent Lamb of Zeri. We apologize for not describing every offering, but lunch will do that to you. We do remember considering Filetto di Chianina, Cozze Ripieno, and Baccalà Marinato. The menu varies according to both the season and the availability of ingredients. For example, the Ravioli con Speck e Caprino can only be offered when the fresh caprino is made. In autumn, we were told, many of the chestnut specialities, including gnocchi, are on the menu. The website has the current menu with excellent English translations. Piazza Immacolata, Filetto di Villafranca in Lunigiana. The cost for two large antipasti, three primo piatti, coperti, water, and house wine was 54 Euro (2012). We felt it an appropriate price for the quality, service and pleasant ambience. Open for lunch and dinner Tuesday-Sunday. Open every day in summer. From Aulla head up the valley on SS 62, or from Pontremoli head down the valley on SS62 toward Villafranca. Turn east (away from the Magra river) from the SS 62 at a marked turn in Villafranca toward Filetto. Just 1 km ahead you'll see the narrow gateway to Filetto with its Do Not Enter signs.